Weston Movers – Discount South Florida Movers has been helping people with all of their moving needs since 2001. Our professionals will treat you and your belongings with courtesy and respect. Moving isn’t easy, but with the right team, it doesn’t have to be a stress. While no two moves are the same, our experience allows us handle any move with in a timely manner. We can help you with any aspect of the move. Our experts can walk you through the things that need to be done before the moving day and the supervisors that are at every job site will plan out the logistics of the move. No matter what you need done we can help you, from packing to shipping to storage. We guarantee you’ll be amazed not only with our service but also our prices. Weston is an affluent suburb in Broward County. The community is very new, having been established in 1996 in large part by Arvida and JMB Realty. They chose to develop the lower western corner of Broward county right next to the Everglades. With a median family income of over $120,000 it is one of the richest areas in the country. Many companies have a presence in this community including DHL, Marriott, Mondelez, and others. The suburb also has access to Interstate 75 and US 27. It also is served by the Broward County Transit bus lines. One of the attractions of the area are the many parks that located within its borders. There Is also an 8000-year-old Indian burial mound in the area. 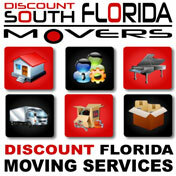 Discount South Florida and Weston movers provide low rates on residential, commercial, piano and long distance moving.